FRIENDS in ART: My Fairy Identity Unveiled! My new Friend in ART is Marsha Jorgensen! 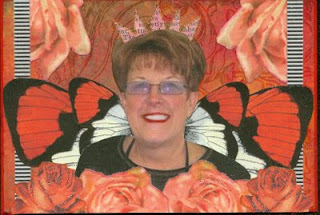 She is the Queen of Butterfly wings and Fairy Images!!!! This is what she can do......remarkable! Her blog is Tumble Fish Studio. This picture was taken during a class with my apron on! and I LOVE the lavender tinted glasses....really set them off!!!! You must visit her blog and see all the wonderful projects she has created. Take the time and leave her a comment!!!! They really do mean a lot! awww how fun! Love it!